In 1993, when the largely white and affluent readership of the Wall Street Journal read this editorial excerpt, the presumption was that the author must be referring to the unfortunate denizens of the urban ghetto. The face of illegitimacy then (and now) were low-income black and brown people incapable of delaying gratification. Without urgent action, these impoverished people would continue to raise staggering numbers of children in single parent households. These poor souls would then perpetuate the pathologies that were figuratively and literally burning down their neighborhoods. But the title of the essay was “The Coming White Underclass,” and the author was Charles Murray. Yes, this is the same Charles Murray who today is being apoplectically protested by college faculty and students who likely have never read this 1993 essay nor Coming Apart: The State of White America, which in 2012 foreshadowed the conditions that would later drive the Trump presidency. Twenty-four years later, Nobel Prize winner Angus Deaton and his wife Anne Case have answered how well the white community heeded Murray’s ominous predictions. In their groundbreaking study, the two Princeton economists document a startling rise in the number of “deaths of despair”—death by drugs, alcohol, and suicide—of middle-aged non-Hispanic whites in the U.S. with a high school diploma or less. Since 1998, white morbidity (the rate of disease in a population) and mortality (the rate of death) became markedly worse and geographically scattered. According to the Brookings Institution, the increase in white morbidity began in the Southwest in 2000. By the mid-2000s, it had spread to Appalachia, Florida, and the West Coast. Today it is countrywide, from deep rural areas to large central cities. Stunningly, this increase in the white mortality rate has come amid the context of gradually improving outcomes among blacks and Hispanics. In 1999, the mortality rate of non-Hispanic whites aged 50–54 with only a high school degree was 30 percent lower than the mortality rate of blacks in the same age group; by 2015, it was 30 percent higher. There are similar crossovers between white and black mortality in all age groups from 25–29 to 60–64. Not surprisingly, the suffering of this older generation of whites has been passed down to the next, most visibly through drug abuse and addiction. A recent New York Times feature, “Inside a Killer Drug Epidemic,” details how America’s opioid crisis has claimed more than 300,000 mostly white lives in the last fifteen years, including some 33,000 in 2015 alone. Enough opioids are now prescribed in the United States each year to medicate every man, woman, and child around the clock for one month. Some public health officials consider it the worst drug crisis in American history, even more crippling than the crack cocaine scourge that devastated minority communities in the nineties. In education, the opioid epidemic has forced school nurses in states as varied as New York, Kentucky, Connecticut, New Mexico, Massachusetts, and Pennsylvania to stock naloxone, an antidote for people who are overdosing on prescription painkillers and opioids like heroin. Like other states considering similar legislation, Rhode Island now requires every middle school, junior high, and high school to have naloxone on hand and ready for immediate distribution. This rise in deaths of despair among middle-aged white Americans, the lethal and accelerating opioid epidemic being experienced by the subsequent generation, and the telltale signs that the youngest generation of whites will face its own struggles, as exemplified by poor literacy outcomes of white fourth graders, are all symptoms of a deeper dysfunction. The 2015 Closing the Opportunity Gap initiative, organized by the Saguaro Seminar, attempted to answer this question. A dozen of the country’s leading experts in education, family, and parenting drew upon the findings of Harvard Professor Robert Putnam’s five-year effort to research the growing inequality gaps in America and why fewer Americans of all races today are upwardly mobile. Despite Murray’s warnings in 1993, the white underclass has arrived, spurred by a wave of his forewarned rise in illegitimacy. 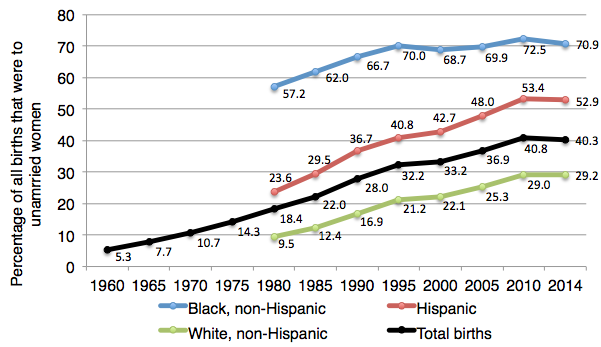 As Figure 1 shows, for five decades, an explosion in unplanned, out-of-wedlock pregnancies and births has been at the heart of the slow, steady collapse of the low-income American family—white, black, and brown—further entrenching already vulnerable populations in multi-generational poverty. SOURCE: “Births to Unmarried Women: Indicators on Children and Youth,” Child Trends Data Bank (December 2015). The resulting family instability, the reduced stigma around absent fathers, and the normalization of single parenthood (especially to women aged twenty-four and under), must now be recognized as a key causal factor for why so many poor and working class Americans across all races are struggling to succeed in school and life. Noted John Hopkins University sociologist Kathy Edin has extensively studied poverty through ethnographic observations and in-depth interviews with hundreds of unmarried, low-income mothers and fathers. Her eyewitness research helps explain why so many poor women have a first baby without marrying, and why men continue to father children before they can afford to take care of them. Edin’s must-read books, Promises I Can Keep: Why Poor Women Put Motherhood before Marriage and Doing the Best I Can: Fathering in the Inner City, reveal that poor young women and men of all races share a common set of human desires to get a good education, secure a decent job, fall in love, marry, raise children in a stable home, and earn a salary that provides dignity and is sufficient to support their family. But an array of structural barriers, neighborhood effects, family precedent, and dysfunctional social norms derail them, leading to choices that unwittingly perpetuate their poverty and virtually guarantee the same outcomes for their children. But whatever regretful choices these parents may have made, Edin’s work also reveals parents’ deep commitment to helping their children build lives that are different and better than their own. It is why many poor parents enter lotteries for public charter schools on the slim chance their child wins a golden ticket. They fight for seats in excellent schools not only so that their children can learn math, science, and the arts, but also because they want us to teach their children the most reliable paths to life success that will allow them to overcome the obstacles they faced as parents. If we want to break the multi-generational cycle of entrenched poverty and income inequality, we must ensure the next two generations—the children in K–12 schools today and their children—understand the mechanisms that will lead to upward mobility. There is a sequence—education, work, marriage, children (after the age of twenty-one), in that order—that many of us in our own personal lives have chosen to follow because we know it gives us and our children the greatest likelihood to lead the lives of our choosing. We cannot deprive our students of the very knowledge that, if they followed this same series of life choices, they would have a 98 percent probability to advance out of poverty and a real shot towards middle-class success and beyond. In his 1993 essay about stemming the tide of out-of-wedlock births, Murray opined, “Matters have not yet quite gotten out of hand, but they are on the brink. If we want to act, now is the time.” Since 1993, the national out-of-wedlock birth rate rose from the already catastrophic rate of below 30 percent to more than 40 percent today. And during that time more than twenty million babies of all races were born to unmarried women aged twenty-four and under. While there are always exceptions of children and single parents who succeeded despite the odds, the vast majority of affected children are suffering the dire consequences of premature family formation. But it is never too late to make things better. The education reform community has a unique role to play because the children of the next generation are in our schools today. Perhaps the only silver lining in the emergence of the white underclass is that it could empower all of us to recognize that racial bias alone cannot explain the conditions many of us have committed our lives to reversing. That the white community is being devastated by drug abuse and deaths of despair creates an opportunity for a unified effort to address the family fragmentation that threatens our common humanity. Racism and poverty still matter and must be addressed. But family structure matters monumentally to the ultimate success of all of our children, and ironically may be the best support to empower young people to have the personal agency to overcome racism, poverty, or adversity of any type. Our parents want and need us as education leaders to be the adults in the room, not silenced by political correctness or fear of accusations of moralizing. They want us to talk openly to our students about the best path to achieve the dreams they have for their children. By having the courage to do so, we would be fulfilling the hopes and desires of the parents who have entrusted us with the most cherished responsibility of educating their children. Let us live up to the highest of their expectations.